Just thought I would share with you, I am so very proud of my Daughter Erica! Erica is also heading up the rider interview section with DZP. Erica Walker, Unfunded’s founder and editor-in-chief, has been smitten with consumerism and fashion since she was a very young girl – probably stemming from the fact that, until she was about 3 years old, her family had her convinced she was born at Wal-Mart (albeit not utterly fashionable, but that’s where her obsession with “things” started). Born and raised in Naples, Florida, a small beach town, she found herself sketching at every moment of the day, which led to her family giving her a sewing machine of her very own at the tender age of 15. She taught herself to use the contraption and began sewing up a storm. The highlight of her senior year of high school was when she was asked to design and create a friend’s senior prom dress (that friend won prom queen that year). While she flirted with the idea of going to fashion school, she decided she didn’t want to miss out on the traditional college experience. This led her to the University of Central Florida in Orlando, Florida, where she obtained a Bachelor of Science in Legal Studies and a minor in Criminal Justice. Following her graduation from UCF, she attended law school at Barry University School of Law in Orlando, FL with the hopes of focusing on intellectual property and entertainment law. During the middle of all of this, she landed an amazing job at a recording studio, which transitioned into scouting out and booking bands for an Orlando venue. Her love of fashion, shopping and design, however, stayed with her the entire way. Erica definitely has a style all her own. This style has been a natural progression of her growing up in and around the motocross, supercross and action sports industries – industries that are synonymous with edge. 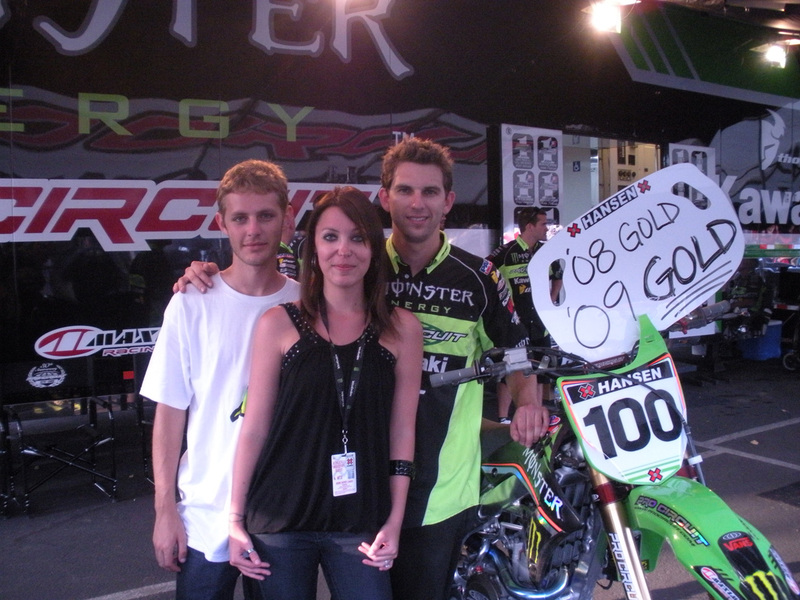 Her brother began racing motocross when he was 6 years old, and , from the age of 12, she found herself becoming a weekend warrior, attending the races every weekend in locations across the country with her family. Surf/skate labels like Hurley, Volcom, and Fox were mainstays in the industry, and are the main reason for her edgy and graphic style. Her style has become a bit more sophisticated as she has grown, but she still sticks to what she knows by incorporating a little bit of toughness into everything she wears. She met her husband-to-be at the races. He had been racing since he was about 5 years old and ended up with a pretty impressive racing career. He also decided to attend UCF and, after working in the industry for a few years, was offered a dream position with the best Lites Supercross team around, Monster Pro Circuit Kawasaki. The job offer prompted a cross-country move from Orlando, Florida to southern California, where the couple now resides. The move to California re-awakened Erica’s love for the fashion industry as she began to notice and love southern California’s signature low-key style and way of life and she realized she wanted to make an impact in fashion…so she started Unfunded. The concept for Unfunded grew out of Erica’s love for fashion magazines, but frustration with the fact that nearly all of the items she loved that were featured in the magazines were completely out of her budget. She wanted a place to showcase affordable edgy fashion and trends. The surf and skate labels she grew up loving just didn’t seem to get enough exposure in the fashion world. Her years as a low-budget college student perfected her ability to shop her closet and make what was old, new again. She wanted to show that it was possible to stay current, trendy and edgy while not spending gobs of money. Most of all, she wanted to showcase awesome products that the normal girl could actually afford. By day, Erica is working full-time at a law firm in southern Cali and she will be finishing her law school education soon. When she’s not in her office at the firm, though, she is exploring new designers, products and events to feature on Unfunded. Her witty writing and graphic, edgy designed site has garnered more attention than she could have ever dreamed for. She absolutely loves her little fashion niche, and has plans of expanding and growing Unfunded as much as she can. Unfunded currently receives an average of 20,000 hits per month and gains faithful new subscribers and fans every day.